Kick off your visit on the 4th (Tue): take in the spiritual surroundings of St. Mary's on the Bank (Maria Am Gestade) and then admire the landmark architecture of St. Stephen's Cathedral. On your second day here, admire nature's wide array of creatures at Schönbrunn Zoo and then admire the striking features of Schonbrunn Palace. To see other places to visit, ratings, traveler tips, and other tourist information, read our Vienna travel planner . Cairo, Egypt to Vienna is an approximately 6.5-hour flight. You can also drive. You'll gain 1 hour traveling from Cairo to Vienna due to the time zone difference. Expect cooler temperatures when traveling from Cairo in September; daily highs in Vienna reach 24°C and lows reach 13°C. Finish your sightseeing early on the 6th (Thu) so you can travel to Prague. Start off your visit on the 7th (Fri): admire the landmark architecture of Prague Astronomical Clock, get to know the fascinating history of Prague Castle, then take in the spiritual surroundings of St. Vitus Cathedral, and finally take in the views from Charles Bridge. On the next day, appreciate the history behind Vyšehrad National Cultural Monument, take in the spiritual surroundings of Spanish Synagogue, then make a trip to Old Town Square, and finally take in the local highlights with Walking tours. To find reviews, other places to visit, maps, and more tourist information, use the Prague attractions planner . You can fly from Vienna to Prague in 3 hours. Other options are to drive; or take a bus. September in Prague sees daily highs of 22°C and lows of 12°C at night. Cap off your sightseeing on the 8th (Sat) early enough to go by car to Dresden. On the 9th (Sun), explore the world behind art at Albertinum, then pause for some serene contemplation at Frauenkirche, and then don't miss a visit to Zwinger. 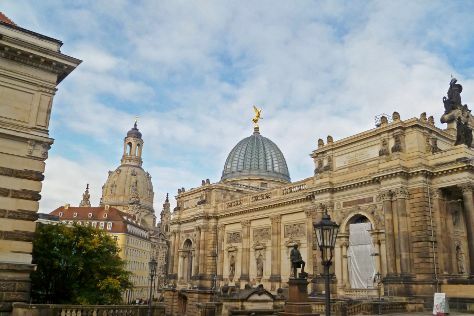 To see traveler tips, reviews, where to stay, and tourist information, you can read our Dresden online trip itinerary builder . Traveling by car from Prague to Dresden takes 2 hours. Alternatively, you can take a bus; or take a train. In September, daytime highs in Dresden are 22°C, while nighttime lows are 12°C. Finish up your sightseeing early on the 9th (Sun) so you can travel to Budapest. Start off your visit on the 10th (Mon): contemplate in the serene atmosphere at Matthias Church, steep yourself in history at Fisherman's Bastion, then get a sense of history and politics at Parliament, then snap pictures at Szechenyi Chain Bridge, and finally pause for some photo ops at Hősök tere. Get ready for a full day of sightseeing on the 11th (Tue): contemplate in the serene atmosphere at St. Stephen's Basilica (Szent Istvan Bazilika), examine the collection at House of Terror Museum, and then contemplate in the serene atmosphere at Dohány Street Synagogue. You can fly from Dresden to Budapest in 6.5 hours. Other options are to drive; or do a combination of train and flight. In September, plan for daily highs up to 25°C, and evening lows to 13°C. Wrap up your sightseeing on the 11th (Tue) to allow time to travel back home.